Asparagus is always a crowd pleaser. Combine mayonnaise, Parmesan, water, anchovies, garlic and lemon juice in a small bowl. 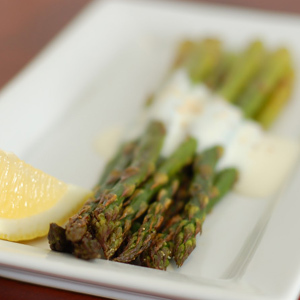 To serve, drizzle the asparagus with the sauce and top with hard-boiled egg. Tip- Boil the perfect egg: place eggs in a saucepan, cover with water. Bring to a simmer over medium heat. Turn the heat off and let the egg sit for at least 10 minutes. Remove and cool completely. This entry was posted in Holiday, Modified Profast (Fast and Flexible) Recipes, Uncategorized, Vegetables and tagged asparagus, easter dinner, fast, lemon, side dish, spring vegetables parmesan cheese by foodies4mmc. Bookmark the permalink.